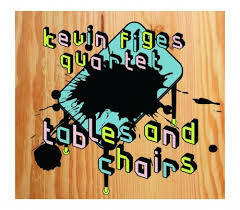 Tables and Chairs, the latest outing for Kevin’s quartet, starts as it means to go on. The title track is launched by Will Harris’s bass riff, a funky, odd time feel looping until Mark Whitlam joins on drums locking in with a clubby hip hop groove and Kevin’s alto snapping out melodic fragments whilst Jim Blomfield adds atmosphere with Fender Rhodes. The blowing is urgent and edgy. This is music made in cities. There are changes of tone and mood amongst this set of originals and Jim alternates between that Rhodes and piano but the tone is set by the opener. New Clothes, is in a similar vein (in 7/4, rule 1 of composition seems to have been nothing in 4/4!). It notches up the energy still further with Kevin and Jim trading fours. I’m sure I caught quotes from Love Supreme in one Kevin’s impassioned bursts. A great video on his website captures something of the urgency and grittiness (filmed allegedly with an iPhone on the dashboard of his car as they trawled the means streets of Bristol). The compositions are built up from little loop like sections often with changes of feel switching in the blink of an eye. 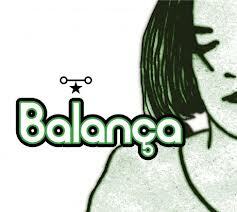 ‘Scrap Board’ alternates between a samba like feel and that clubby vibe again in an odd time. ‘Here You Are’ with a generally more languid feel is like two contrasting compositions. Despite the sharp writing and blowing, there’s no missing the leaders instinct for a well crafted melody. ‘Fortunately Unfortunately’ has an attractive theme that floats over another off centre latin groove and ‘For Becky’ is a plaintive tune with another 7/4 time signature skewing the bossa like pulse. Last Outpost, the most ballad like track with a hymn like theme at its core, is introduced by a sparse, spooky riff that dissolves into a thunderous solo piano workout by Jim before that tune emerges to calm us down. Tables and Chairs is a coherent set of originals that grabs you by the ear, pulls you along and repays repeated listens. This is a fine band at the top of their game. Kevin’s musical puzzles demand a lot of the rhythm section and Mark Whitlam and Will Harris make it sound easy. Cathy Jones’ Balanca have been exploring and refining their take on Brazilian music for a few years now and this short CD, a collection of five sambas and spritely bossas by Jobim, Brazilian chanteuse Joyce, Pat Metheny and a Cathy herself is the first chance we’ve had to pop her in the CD player and bring a whiff of the beach and sunshine inside. This is a tight unit and their familiarity with each other and the music is evident from the first breath of Cathy’s wordless vocal line over the changes of Chega de Saudade doubled by Kevin Figes’ alto, the two blending beautifully. Tristam Cox on guitar, Thad Kelly on bass and Mark Whitlam on drums lock tight on every tune providing a liquid groove. There’s some lovely melodic soloing from the sax and guitar and the thoughtful almost understated delivery gives this taster EP a really appealing and distinctive sound. 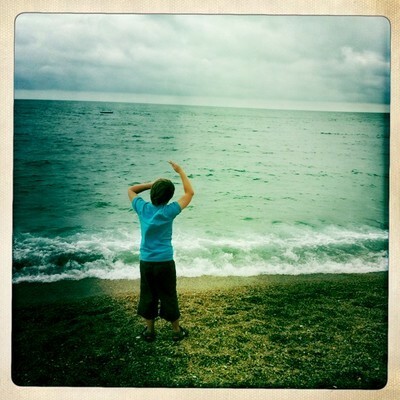 Wave Forms and Sea Changes is something of a landmark for pianist Jim Blomfield. He’s been a mainstay of the Bristol scene for close to twenty years being a fixture in Andy Hague’s Quintet as well as Kevin Figes’ Quartet, numerous latin and salsa projects, writing for experimental Resonation Big Band and more or less house pianist throughout that time for visiting soloists to the city’s long running BeBop Club. Regular samplers of live jazz will be no strangers to his tumultuous virtuosity. Opportunities to hear Jim’s own compositions and an ensemble led by him have been rarer. Septimbre, a seven piece band, was the only previous recording a few years ago. This shortly to be released trio recording will eagerly anticipated by his many admirers. If there’s an overlap with some of the territory occupied by Figes’ ‘Tables and Chairs’ release (aside from the presence of Mark Whitlam on drums and of course Jim himself), with odd metre ostinato figures on bass and clattery drum grooves on several of these distinctive compositions, another side to the pianist leader is revealed over the course of these 10 originals. There are plenty of flowing arpeggios that evolve and develop angular harmonies resonant of modern classical music inspirations as well as bang up to date bursts of driving post bop modal work outs, notably on the epic ‘Now and Zen’. ‘The River runs deep’ is a flowing romantic piece with Tosh Wijetunge’s bass doubling the singing melancholic melody and then the piano’s left hand arpeggios. ‘Rum Thing’ showcases everyone’s blusey jazz chops on jaunty groover with more than a hint of a New Orleans second line. And scattered between these carefully crafted pieces, fragments like Sea Changes and Impermanence wouldn’t sound out of place in an updated Debussy piece. If this collection has been a long time in gestation, its been worth the wait. A wider range of moods and palettes are developed than we sometimes see with him as sideman and in Tosh and the ever resourceful Mark Whitlam he has found an ideal foil. A while back Jon Turney wrote a piece for London Jazz on the ingredients that make Bristol’s Jazz scene so fertile. Among the pool of musicians and reliable rhythm sections he pointed to as essential elements, most of the musicans on these recordings were name checked. So lets here it again for Kevin Figes and Pig Records for getting the music out to a wider audience. Go see them. Buy the CDs.